A broad spectrum of technical papers on the most diverse nondestructive testing techniques (NDT) and correlated fields are presented in this volume. The main applications and methods of these important quality control techniques are reviewed in depth. Apart from reporting on the improvements and developments of new techniques and the rapid automatization of nondestructive testings, many papers address the environment from the point of view of inspection surveys. 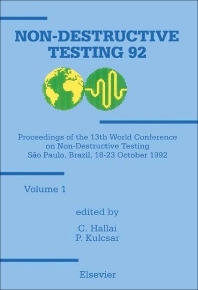 The 265 contributions demonstrate that nondestructive testing techniques (NDT) play a vital role, not only in the quality assurance and control of manufactured products, but also as instruments of public, environmental and industrial safety. The quality of the articles in this book attest to the contribution this conference has made in the technical interchange of experience between NDT professionals, and indicate the present accelerated rate of development of ideas and knowledge in this field. Abbreviated. Plenary Talk. Reliable solutions to engineering problems in testing through acoustic signal analysis (B. Raj). Acoustics. Excitation of acoustic waves in electroconducting specimens (O.G. Alexeev et al.). Acoustic Emission. Damage evaluation of concrete test specimens by acoustic emission (J.M. Berthelot et al.). The location of acoustic emission with shear wave transducers (J.J. Zhang et al.). Fabrication of the artificial reference defects for non-destructive testings (G. Bonavero). The non-destructive testings technician formation (C.R. Vilhena, I.T. Souza). Electric Techniques. Processing of cartographies from steam generator tubes using eddy current testing with an absolute coil (P. Attaoui et al.). Evaluation by eddy current techniques of copper filled corrosion crevices in heat exchangers (G.H. Wijnants et al.). Holography. Improved holographic blind-hole methods for measuring residual stress (S.T. Lin, C.P. Hu). Leak Testing. Early failure detection using a bank of Kalman filters: A heat exchanger model (E. D'Attellis et al.). Magnetic. Evaluation of field distribution mapping results in yoke magnetization (T. Aastroem). Development of magnetic on-line minute defect inspection system for strip steel (T. Yamane et al.). Evaluation of concrete quality. Lateral pressures test (A.A. Di Maio, C. Rocco). Use of photogrammetry to size oil-industry equipments (A.G. Sperandio et al.). Penetrant. Electroosmose penetration (Chen Shizong, Chen Gouyu). Radiation Techniques. Development of a backscattering sensor for gas distribution pipes (G.M. Borgonovi, V.V. Verbinski). Fully automated X-ray testing of cast parts (M. Purschke, M. Schaefer). Radiography. X-ray microradiography and neutrography techniques in non-destructive evaluation of structural materials (A. Camanzi et al.). A new method for measuring the MTF of X-ray solid-state linear detectors (Y.M. Zhu et al. ).Thermal and Infrared. Industrial non-destructive testing of composite materials by stimulated infrared thermography (S. Abbé et al.). Remote sensing infrared study of detecting external and internal flaws by means of active thermal incidence (Y. Okamoto et al.). Tomography. Computerized echo tomography for turbine rotor inspection (R. Crudeli et al.). X-ray computered desk microtomograph BT-50 (E.I. Weinberg et al.). Ultrasonic. On-line measurement of r-value for cold-rolled steel sheets using resonance mode EMAT (T. Akagi et al.). Acoustic holography applied to advanced composite materials (J. Bernardi et al.). Robotized system for the acquisition and management of thickness measurements in service with corroded surfaces (C. Gilardoni et al.). New developments of the ultrasonic P-scan technique and new perspectives in the automatic ultrasonic inspection (S.E. Iversen). Design and construction of a PC board for optimal excitation and processing of ultrasonic signals in peizoelectric transducers (O. Martinez et al.). High temperature evaluation of the Young's modulus on ceramics by ultrasonic measurements (S. Müller et al.). Development of an acoustical visualization system for non-destructive testing of composites (J.B. Santos et al.). Defect sizing with convergence of beam in ultrasonic inspection (S.L.B. Zin, T.R. Strohaecker). Visual and Optical. surface inspection and classification plant for stainless steel strip (G. Canella, R. Falessi). An improved electropolishing technique for in-situ metallography of components and its applications for non-destructive evaluation (G. Venkataraman). Vibration. Estimate of articles quality by free vibration method (V.V. Boulanov). Vibration analysis in predictive maintenance (U. Südmersen et al.). Late Submissions. Experimental methods for testing the pull tension of chains (S. Briccoli Bati et al.). Establishment of an ultrasonic acceptance criteria for pipeline circumferential joints designed to be X-rayed (A. Sakamoto).